This lesson will guide you through the process of modifying the data column arrangement, updating column names, and other formatting options on a Custom Report. Once you've added data to your report, the data columns in the order you selected it. You may want to re-organize that in a different order after you've selected all the data you want. Within your Custom Report, click Manage Columns. Use the checkboxes to the left of a column name to Hide the column from appearing on your report, but still want it included for filtering or calculations. Review the Data Column Title and edit or change the title as desired. The Category the column was pulled from and original column title are displayed with the column title. Format allows you to convert data in the column to lower or upper case for text or round numerical values. 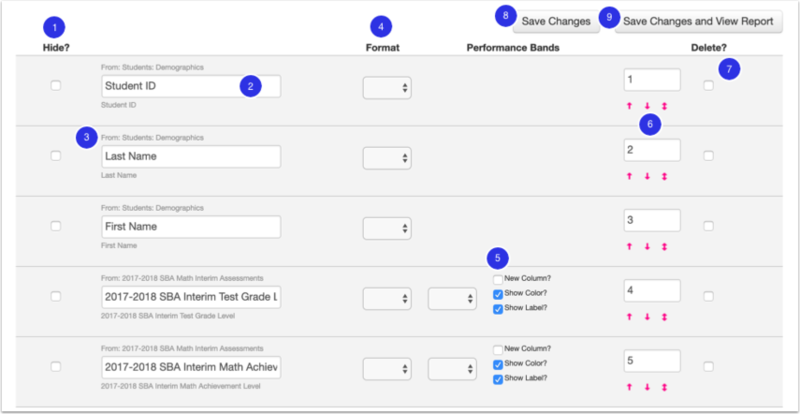 If data is a numerical value, you can create and assign Performance Bands to provide a visual indicator of progress or results. Additional options such as making the applied performance band into a new column, to change the value to just show colors, or just show the applied performance band label are available. Order columns by changing the number in the box or use the arrows to move them around. Clicking the up arrow move the column up one, the down arrow moves it down one, or click and drag the dual arrow to physically drag the column where you want it. Use the checkboxes to the right of the column number to Delete a column from your report. To apply changes but continue managing your columns, click Save Changes. Ready to view your report? Select Save Changes and View Report to see the updated report. Now that you have arranged and modified your data columns, learn how to Use Filters on a Custom Report.